We have been named as one of three winning companies to receive a share of £2.2 million to continue developing our innovative design concept for a new generation of passenger rolling stock for use on the UK rail network. The funding has been made available through ‘Tomorrow’s Train Design Today’ (TTDT), an international competition led by RSSB’s FutureRailway programme team in association with the Department for Transport. Our winning concept is based on a flexible purpose carriage that can be quickly reconfigured to carry passengers or freight as required. 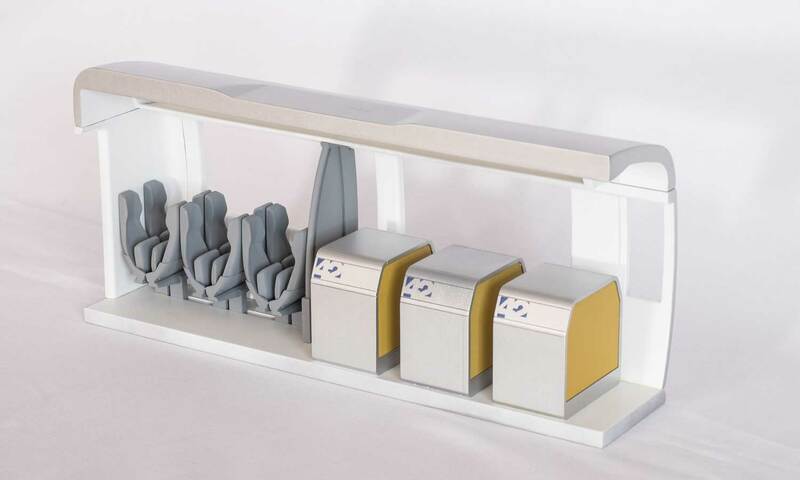 When passenger occupancy levels are low, for example at off peak times or when commuter trains have delivered their passengers and are returning to the suburbs, the seats can be automatically moved and stowed to allow room for freight. This novel approach will help ease road congestion by encouraging more freight onto the railways, while delivering additional revenues to the UK rail network in excess of £100 million through more intensive use of rolling stock and without any significant increase in operating cost. In addition to making the award, the judging panel also specifically praised 42 Technology for the quality of its development work and strength of its presentation setting out the commercial and technical feasibility of their approach. The judges included directors and senior managers from leading UK transport operator FirstGroup; train leasing specialist Angel Trains; train manufacturer Hitachi; and the Design Council. Everyone at 42 Technology is delighted that our outline designs and business case study have been so strongly endorsed by the competition judges. The next stage is for us to move ahead with detailed designs and to build a full scale demonstration model showing the adaptable carriage in action. The TTDT competition was split into two strands focused on new design ideas for medium and longer-term rolling stock. 42 Technology and PriestmanGoode were both named as winners in the next generation/medium term category. Andreas Vogler, in partnership with the German aerospace centre DLR, was chosen to progress its longer-term rolling stock design concept. The ‘Tomorrow’s Train Design Today’ competition was launched March 2014 in direct response to the ‘Long Term Passenger Rolling Stock Strategy for the Rail Industry’ (originally published February 2014). 4CS – targeting longer-term designs which needed to address four key areas: cost and carbon reduction while improving capacity and the customer experience. A total of 48 entries were received in the first stage of the competition before 10 practices were shortlisted to receive £75,000 each to fund next stage development of their design concept. FutureRailway is a collaboration between Network Rail and RSSB (the Rail Safety and Standards Board) and has been set up to accelerate research, development and innovation across the UK rail industry. One of the team’s key objectives is to seek out innovative ideas and proposals from across the industry supply chain by understanding the challenges that industry faces; connecting potential innovators with these challenges; and where necessary providing potential funding.